Ecalpemos: Try praying? Must try harder. Try praying? Must try harder. 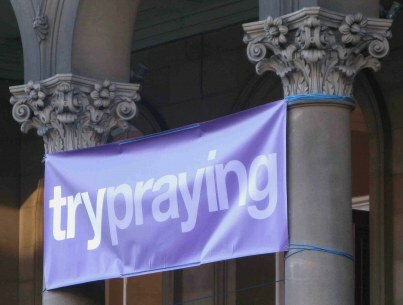 Following on from the Alpha course my local churches are now sporting “Trypraying” banners as a way of encouraging people to engage with the church. Trypraying is based around a booklet which a Christian can give to someone which encourage them to pray over a set time period. You can download a copy of this booklet on their website. The premise is that if you do try praying and something happens that this is evidence that God exists and that the claims of Christianity are true. Whats not to like? There is not necessarily a cause and effect at work here. For every 100 people who try it a few may have something happen which they consider to be the result of prayer. However, some will be due to coincidence and some due to the tendency for the human mind to look for patterns of cause and effect. This is exactly how horoscopes work. Keep things vague enough and a range of events can be ascribed to the prediction or indeed the prayer. It works the same way as the suggestion of Mormon missionaries that you need to pray about the book of Mormon to find out if it is true. A small number of people will get a feeling that its true, but that’s all that is needed. Its a numbers game. Get 1000 to pray and you may get 30 recruits this way. In this way its quite cynical and manipulative. Then there is the awkward issue of those who pray and don’t get any result. Christians pray and don’t get answers all the time so why do they think non believers will? And by putting so much emphasis on this they may be getting people to self exclude themselves from any connection with church in the future. Its a high risk strategy. Not that any of this will put off the churches who are promoting Trypraying. Like Alpha it is a well packaged campaign which has momentum behind it and which can be easily plugged into any church. This impetus means that few will question its methodology or its likely results. How to put a link in a blog comment. Nuclear Power - Yes Please?